Today is a very special Blog Hop as we are celebrating parents! Did you know that Altenew is doing a card drive!? The goal of this card drive is to send cards for the elderly that lives in nursing homes or shelters to let them know they’re not forgotten. Please check out the Celebrating Parents Card Drive and join this great cause by sending in cards. This past Christmas, I gave away over 100 cards to the retirement home where my father-in-law now resides. Everyone in the home was so appreciative and happy when they received my cards. If you arrive from the blog of Svitlana Shayevich, you are in the right place! I am super excited to share a special card that I create for my 87-year old mom in Taiwan. You might ask how I I came up with this very layered design. I incorporated many elements ( cover die, stamps, pattern paper) into one card. In the end, the elements all come together and seem to "make sense". As a parent, I know how important it is to play a positive and influential role in our children's lives. For me, being a parent is a huge privilege and blessing in my life. I also honor my parents as they sacrificed so much for the next generation, so we can have a better life. Prizes: to celebrate this release, Altenew is giving away a $30 gift certificate to 6 lucky winners. 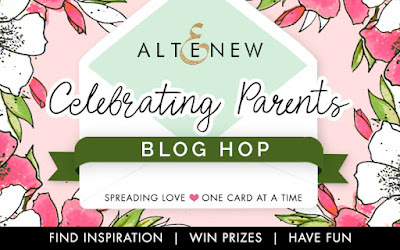 Please leave a comment on the Altenew Card Blog for a chance to win! 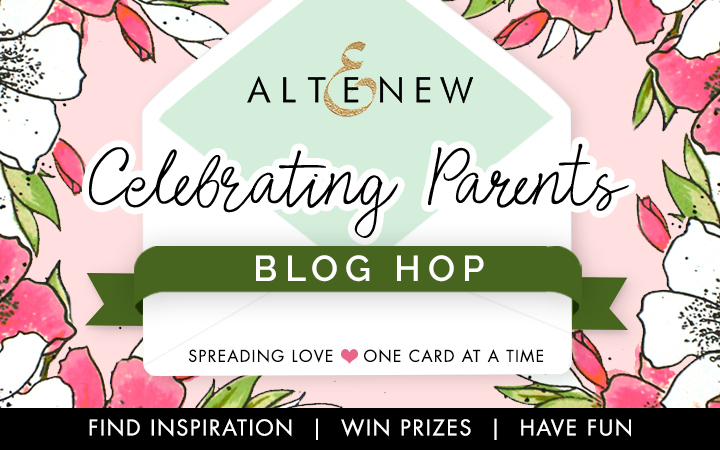 Extra Giveaway: Altenew will also draw a winner to receive a $15 gift certificate in each designer's blog (such as my/this blog ) in this hop. All winners will be announced on Apr. 17 , 2019. 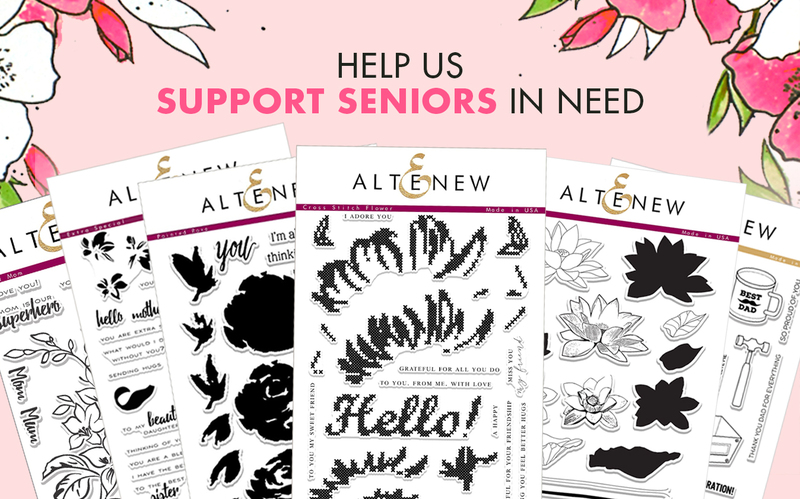 Giving Back Info 20% of the profits earned from select stamp sets (Best Dad, Painted Rose, Extra Special, Lotus, Cross Stitch Flower, and Best Mom) by 6/16/2019 will be donated to the Food Bank of Central New York to support seniors in need. You have a great heart. Thank you for your beautiful inspiration. You’re right, a parent’s love comes in all forms. Gorgeous! Your gift for layering and texture created a treasure for your mom. The butterfly is a new product for me and on my wish list. Virginia, this is so lovely. I love the story of your father-in -law. I have a great aunt who lives in a nursing home, and I wish that I lived closer so I could go and visit her, but I do send her cards, and I know she really appreciates it. Love your card! Always love seeing your designs! This is a gorgeous card! I love the letter over the butterfly. It's perfect! Very pretty vibrant color. Love the butterfly acetate. Love the butterfly and large M on this card!!! Thank you so much for sharing your talent! I love your card! I think it is fabulous! Gorgeous card! Stunning design, layers and the color palette is absolutely gorgeous! Your Mother surely will adore this card. Such a combination of elements to produce one cohesive whole is difficult to achieve but so worth the effort. Just beautiful, Virginia. Lovely card. I'm sure your mom with be pleased. Love the symbolism. Thanks for the inspiration! 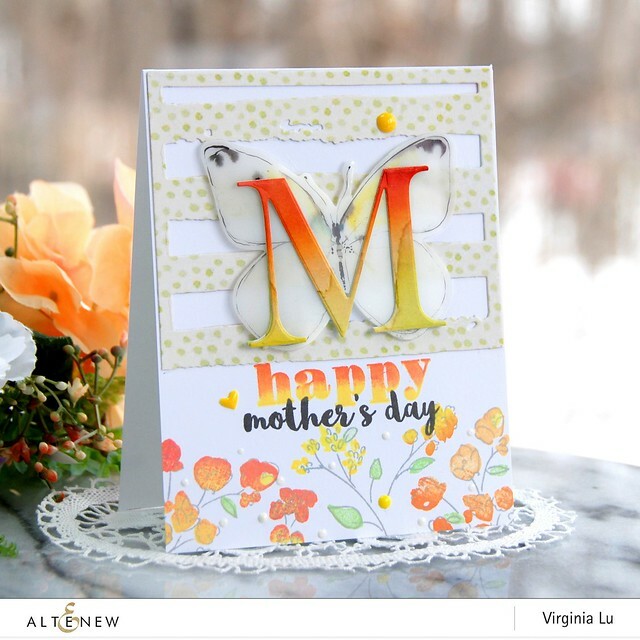 Your card is gorgeous - I especially love the overlying of the M over the butterfly - I love all the layered details. your mom will love that! So feminine and lovely a card. WOW. Very cheery card, nice technique and great idea! Thanks! Besides making a beautiful card, you wrote such a grateful blog. I especially like your explanation of the card's layers. Love your card Virginia. So many wonderful elements that all bend together to make a very pretty card that I am sure your Mum will love. Such a lovely card. Love the colors you've used. I love the ombre warm colors! Great for mom! Lovely card Virginia. The color combo is so cheerful. Is sure to brighten someone’s day! Thanks for the inspiration! A pretty card with subtle colors and I like how the butterfly is placed under the letter. Beautiful card, Virginia! So special that you've shared your pretty cards with the residents where your father-in-law resides. I was involved at an assisted living facility for several years while my aunt lived there and I know how much these cards mean to the residents. Very lovely card. I ( along with my sister-in-law). make cards for a rehab center where my father was briefly a patient. The activities director says the cards mean a lot, especially the birthday cards. Think the card drive is an excellent idea. So pretty Virginia. I miss not being able to make a card for my own Mum. Such a cool idea to have this card drive. Beautiful! Your mother is going to love her card! Love this beautiful card, Virginia! The layers and colors are so pretty and I am sure your mom will LOVE it! Very pretty design. 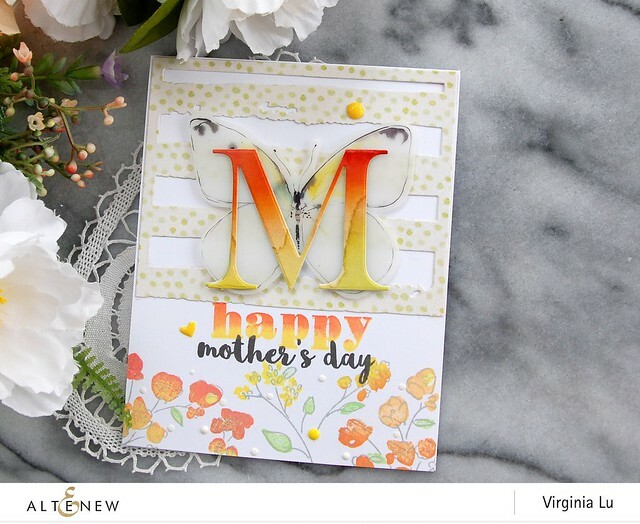 I like the butterfly behind the M.
I love how you spoke so graciously of your parents, and created this beautiful and layered card. I love the layers! This is just lovely, Virginia! Such a pretty design, Virginia! I love the butterfly! So much beautiful detail, lovely card. Very pretty card. Love all the layering you have done. I love your beautiful card. The colors are beautiful!! The butterfly behind monogram is so pretty!! Beautiful colors, love the details. Lovely job. Thanks for sharing your creativity! What a pretty card, with so many interesting elements. I am sure your mom will love it! Absolute stunning! The colors on the "M" are lovely-almost like it's on fire. It looks great against the butterfly. I love all of the layers. Gorgoeus card which I am sure your mum will love. I sure the recipient of your 100 cards were all delighted. Thank you for your inspiration Virginia. 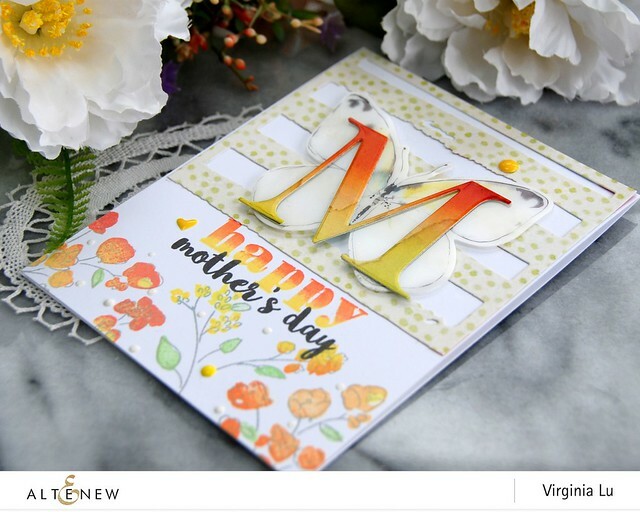 Such a beautiful card for your Mom, Virginia. I am sure she treasures it! And all those cards for the nursing home---you rock! Such a great project here. I just love the soft colors you chose. Thank you for your amazing inspiration! Placing the colored M on the butterfly - great look! It is beautiful and I try to honor my parents just like you. They did a lot for me and even at 50, I don't like to disappoint or disparage them. Great work Virginia!!! Moms are the best and your card is a great card to honor mom! Love it. Thank you.